Three things a Valentine's table does NOT have to have to be romantic. 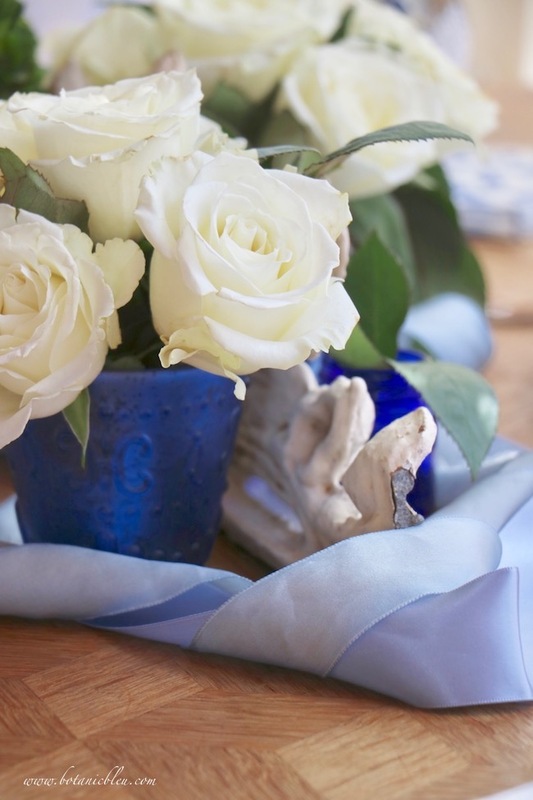 White roses and blue ribbons create a romantic table for celebrating Valentine's Day with friends, family, or lovers. Romance does not require pink or red. Indeed, if blue is your true love's favorite color, then blue is more romantic than red. As January draws to a close I am slowly catching up on cleaning, organizing, planning, and dreaming. Notes to myself in a blue notebook about French-inspired country living keeps me from forgetting the plans in my mind. For people who live in snow-prone areas of the world, snow is not always a beautiful sight. Bundling up for work, getting the car to start in sub-freezing temperatures, and seeing mounds of snow in grocery parking lots pushed up in heaps with black soot become dreary. For those of us who live in areas where snow is rare, snowfall is magical. We know it will only last for short periods of time, sometimes just fleeting minutes as the flakes melt hitting the ground. Other times there are serene scenes as our world comes to a standstill for the snow. 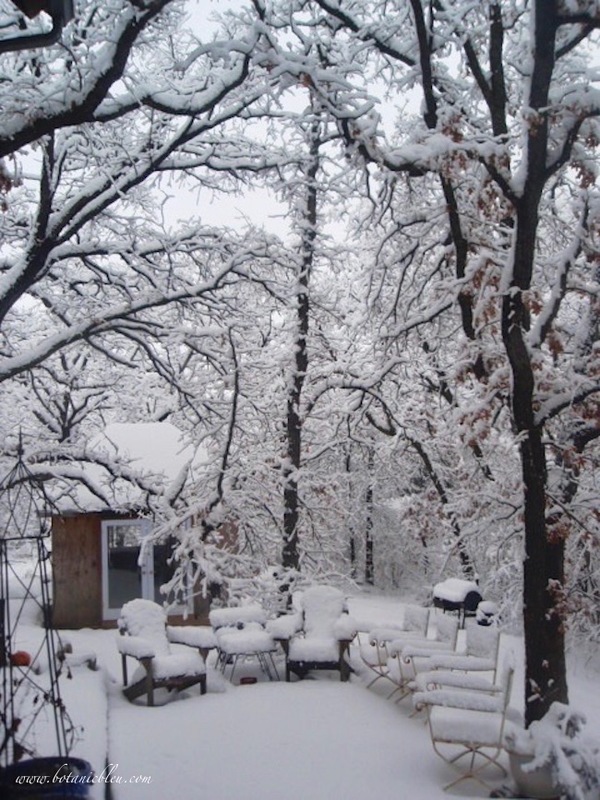 Enjoy the beautiful scenes of a heavy snowfall for us in 2010.
and of the house before the covered porch was added. with a request for input from my readers. Click on the white ARROW to begin the slide show. Then click on the box in the lower right corner to enlarge the photos to fill your entire screen. 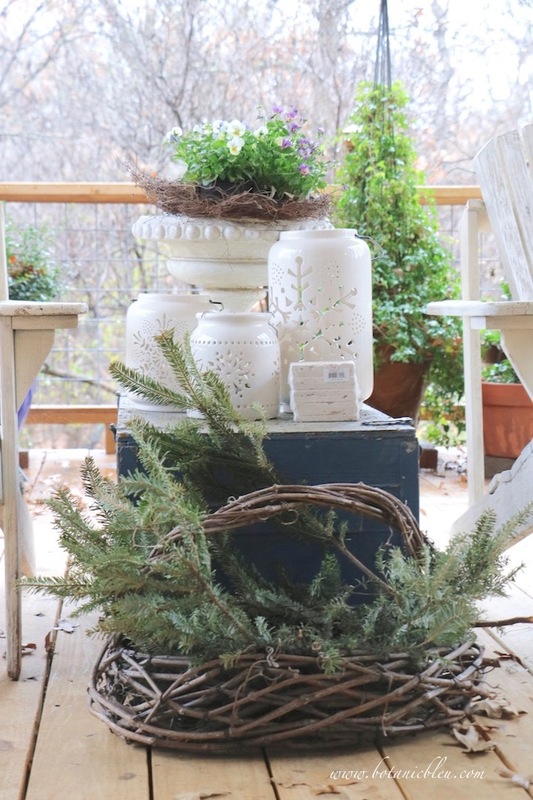 The previous post on Botanic Bleu was Winter Porch Plants with standard photos and text. 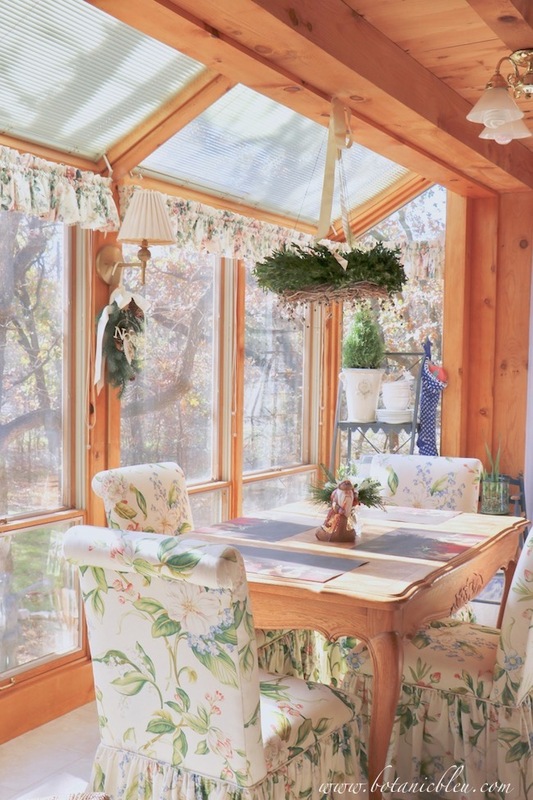 The above video/slideshow is another view of the Winter Porch in a different format. Recent articles in the virtual world indicate videos are preferred over the written word by most people viewing information on the Internet. 1] Is the video/slide show above appearing on your computer, mobile device, notebook, etc...? Are there any glitches? 2] Did this post load at its normal speed or did this post load slower than usual? 3] Which do you prefer? The original Winter Porch Plants post or the video/slideshow version with music? 4] Would you like a blog post with the video/slideshow at the top followed by several paragraphs of text? 5] Or would you prefer the video/slideshow with just ONE short paragraph? 6] Why do you like the version you chose? 7] Any tips or suggestions? I will continue to experiment with different versions of slide shows and videos this year, but most posts will be in standard format with still photos and text. I will be looking for a better way to show slides and/or video. Thank you for giving your feedback in the comments below. A quick update on real-time life and why there have not been any new posts for a couple of weeks... I had a good visit with my brother out-of-state followed by a trip to California with my sister, the professional florist. She had a floral job for 40+ centerpieces at a dinner in the San Diego Hilton Hotel, and I went along to help (a little.) Of course, since we were in California we had to take a few days vacation before heading back home. We missed almost all of the frigid temperatures at home while in San Diego where we had balmy 70°-80° days. My sister and I will be traveling to spend time with our brother in the days to come. Future blog posts may be irregular. Right now I am trying to get caught up on everything here at home. There is the small matter of a broken water pipe from the freezing temperatures, but fortunately the pipe is outside the house between the house and garden shed. The cut-off water valve works as designed and allows us to have water in the house. No pressure to get the outside pipe to the garden shed repaired means it may be a few weeks before I tackle that. Then there are the mountains of laundry and usual household bills that need attention now. Thank you for reading. Keep cozy and warm as we dream of spring. 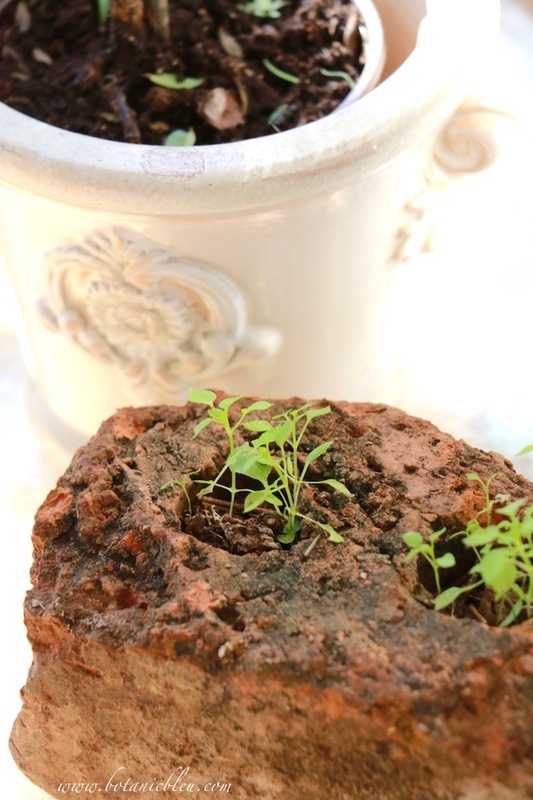 Even in winter, there are several plants to enjoy on a porch. In north central Texas, winter weather is usually mild enough to enjoy porch living for many of the days during winter. Part of enjoying the porch is having evergreen plants, and an added bonus is having blooming flowers. Here it is January 5, almost midnight, and I am just now sharing photos taken in my French-country-inspired kitchen this Christmas. Why so late? Everyone's life is filled with highs, lows, and mostly in-betweens. The rhythms of our days most often flow, but sometimes the rhythms of our days are jagged with sharp edges as we lurch from one day to the next, keeping our heads above water, but just barely. Carefully laid plans fall aside as more pressing issues crowd around us, pushing us into another direction.